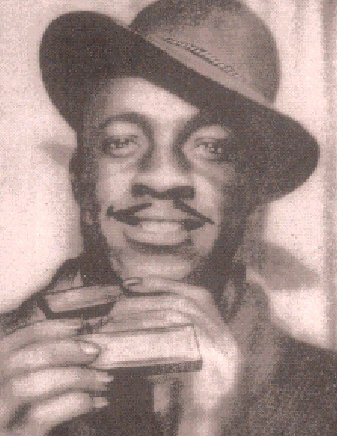 Sonny Boy Williamson (John Lee Curtis Williamson, March 30, 1914 — June 1, 1948) was an American blues harp player, and the first to use the name Sonny Boy Williamson. He is often ‘overshadowed’ by another great harp player who took his name (Sonny Boy Williamson II) Aleck Rice Miller, but no one can doubt he took blues harp playing to another level. He stretched the boundaries of the instrument by the use of his hands and his imaginative fills and using it more for lead instrument playing by his ‘call and response’ method of alternating vocals with instrumental verses. Born in Jackson, Tennessee, Williamson taught himself the harmonica as a child, influenced by great players like Will Shade and Hammie Nixon from nearby Memphis. By the time that he had reached his teens, he was already a master of the instrument. Using the name “Sonny Boy” Williamson, he traveled during the depression, performing with artists like Robert Nighthawk and Sleepy John Estes. Although cut down, prematurely, in 1948 by a mugger, he left enough of a legacy to influence such players as Little Walter just as electrical microphones took the instrument to new heights. Being an amateur blues harp player it is great to have the opportunity to do a little research and share some thoughts about the greats. A good starting point is to get a couple of Muddy Waters CDs and trawl through the different harp players that Muddy recruited and provided the space for them to grow, such as Sonny Boy Williamson, Little Walter, Junior Wells , Walter Horton, James Cotton, Charlie Musselwhite, Paul Oscher, Carey Bell and Jerry Portnoy just to mention a few. They don’t all get into the top ten, but of course this is all subjective. Sonny Boy Williamson II (Aleck Rice Miller) was, in many ways, the ultimate blues legend. By the time of his death in 1965, he had been around long enough to have played with Robert Johnson at the start of his career and Eric Clapton, Jimmy Page, and Robbie Robertson at the end of it. What is known is that by the mid ’30s, he was traveling the Delta working under the alias of Little Boy Blue. With blues legends like Robert Johnson, Robert Nighthawk, Robert Jr. Lockwood, and Elmore James as interchangeable playing partners, he worked the juke joints, fish fries, country suppers, and ball games of the era. Known as the “Godfather of the Blues,” Junior Wells was able to grab an audience by the ears and take them on a musical roller-coaster ride with his own unique spin on the classic Chicago blues sound. Often performing alongside guitarist Buddy Guy, Wells enjoyed a lengthy career that spanned 50 years, his staggering harp solos and vocal interplay defining the Chicago blues harp sound at a time when the music was still shedding its country roots, taking the music to new heights of critical acclaim and commercial acceptance. More than any other harp-slinger, “Little Walter” Jacobs owned the Chicago blues scene from the moment of his arrival in 1946, and through the end of the 1950s. A dynamic soloist, Little Walter created new tones and bright new textures with the instrument. An underrated vocalist with a gritty, soulful voice, Walter was also a skilled songwriter and natural-born bandleader. The dominant blues harp player of the post-war years, Walter’s influence can still be heard in the music of harpists like Charlie Musselwhite, Rod Piazza, and Kim Wilson. Musselwhite masters the old Chicago tradition and at the same time experiments like no one else does. Understanding what position he plays on certain tunes is an interesting challenge! Blues harpist Charlie Musselwhite rose out of the Chicago blues scene of the 1960s and, along with Paul Butterfield, helped bring blues music to a young white audience. His move to Northern California late in the decade brought the blues to the children of flower-power and, in the decades since, the artist has been an effective ambassador for blues music. More than anything, however, Musselwhite has helped expand the stylistic barriers of the blues, bringing elements of jazz, Tex-Mex, and even world music into his traditional mix of Delta and Chicago blues styles. From one of his best and early albums ‘stand back’ – you must listen to Christo Redemptor…. Paul Butterfield changed from playing the flute to playing blues harp and teamed up with Elvin Bishop and toured clubs where they met and played with the likes of Muddy Waters, Howlin’ Wolf, and Junior Wells. “In the 1960’s in the blues clubs on Chicago’s south side, the Paul Butterfield Blues Band was setting off the first depth charges of what would come to be a worldwide blues explosion. Butterfield played and endorsed (as noted in the liner notes for his first album) Hohner harmonicas, in particular the diatonic ten-hole ‘Marine Band’ model. He played using an unconventional technique, holding the harmonica upside-down (with the low notes to the right hand side). His primary playing style was in the second position, also known as cross-harp, but he also was adept in the third position, notably on the track ‘East-West’ from the album of the same name, and the track ‘Highway 28’ from the “Better Days” album. Seldom venturing higher than the sixth hole on the harmonica, Butterfield nevertheless managed to create a variety of original sounds and melodic runs. His live tonal stylings were accomplished using a Shure 545 Unidyne III hand-held microphone connected to one or more Fender amplifiers, often then additionally boosted through the venue’s public address (PA) system. This allowed Butterfield to achieve the same extremes of volume as the various notable sidemen in his band. Butterfield also at times played a mixture of acoustic and amplified style by playing into a microphone mounted on a stand, allowing him to perform on the harmonica using both hands to get a muted, Wah-wah effect, as well as various vibratos. This was usually done on a quieter, slower tune. Probably sitting more with the generation before the ‘electric’ harp players based in Chicago, Sonny Terry represents the last of the acoustic harp players. “Whooping and wailing like a man possessed, Sonny Terry drew listeners into a sultry musical world populated with hot headed women and worried men. Though he often employed an ethereal falsetto voice, he was also capable of unleashing hair-raising hollers. His harmonica style was similarly compelling. “One of Chicago’s defining harpists (though often overshadowed by legends like Junior Wells)… Born in Macon, Mississippi on November 14, 1936, Bell moved to Chicago in 1956 with his godfather, respected blues and country and western pianist Lovie Lee. And where would you put Billy Boy Arnold and George Smith ? Just add some more of your favourites and decide where they go in the top ten! RECORDED EVIDENCE. In order to earn a spot on one of the top 10 lists , a player (or the partisans of a player) must be able to convince with the help of recorded evidence. Buddy Bolden was the greatest trumpet player ever to come out of New Orleans, many say, but he never made a recording. Obviously the best and most influential players can’t be fully summarized by 10 minutes’ worth of vinylized or digitized performances, and some players–John Lee Williamson in particular–don’t benefit from this exercise. Still, it has its virtues as a teaching tool and a way of guiding the conversation. And if you want to learn blues harp playing then a good place to start is with Adam’s lessons on you tube and on his web site. So listen to all blues harp players from the last 100 years (plenty of remasters around), as well as practising whenever you have a quiet moment -easy instrument to carry around so no excuses. And remember what Adam says -listen to a wide variety of music to understand rhythm and improvisation.